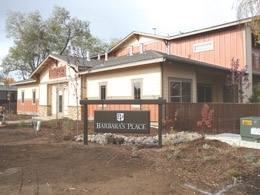 Barbara’s Place Apartments, a new, permanent supportive housing project in Redmond is nearing completion and will begin fulfilling its purpose this month when it welcomes the first round of residents. which will become the ownership entity once construction is done. It will serve special needs clients of Mental Health Services and those who are homeless. There are certain income and situational requirements that must be met and the rents will be subsidized by Oregon Housing and Community Service. The smell of fresh paint and wood permeated the hallways as a hive of activity hustled to meet deadlines. The structure’s basic footprint is 3,900 square feet and the second floor comes in right at 1,500. There are six self-contained apartments with complete living quarters including full kitchens, washer and dryer, bathroom, living room and a single bedroom. Each unit measures approximately 700 square feet. Peter Baer and Doug Alley of Pinnacle Architecture in Bend provided the efficient design work. Staff members from Deschutes County Health Services will eventually be on site in addition to a part-time property management agent. Prospective applicants can stop by for information, get screened and placed on a waiting list. The high ceiling design and warm wall colors makes for a comfortable, modern feel, well lit and bright. For questions or more information on Barbara’s Place please contact Keith Wooden with Housing Works at 541-323-7412.